The following is a fairly comprehensive list of Hammett’s fiction, organized by date of publication, along with where these stories can be located today (if anywhere). Both of these Continental Op stories originally appeared in the same issue of Black Mask, October 15, 1923. 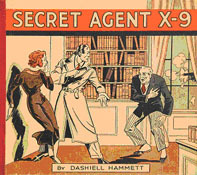 The March 1, 1924 issue of Black Mask contained two Hammett stories: “Zigzags of Treachery,” which featured the Continental Op, and “Afraid of a Gun,” which didn’t. Both were reprinted in Nightmare Town. “Zigzags” was also reprinted in Crime Stories and Other Writings. Most recent reprint: Vintage Hammett, 2005. Also Crime Stories and Other Writings, 2001. Recent reprints: Crime Stories and Other Writings, 2001. Nightmare Town, 1999. Most recent reprint: The Creeping Siamese, 1950. Note: “The Big Knockover,” when combined with its sequel, “$106,000 Blood Money,” form Blood Money, which many consider to be Hammett’s true first novel, predating Red Harvest by two years. Since the 1960s, however, they have almost always been presented as two separate short stories, rather than as a novel. Most recent reprint: Return of the Continental Op, 1945. Published by Alfred A. Knopf, January 1931. For some reason, Knopf released The Glass Key slightly earlier in the UK than in the USA. The UK edition is shown here. Creeps by Night: Hammett wrote the introduction to this 1931 horror anthology, and is credited as editor. Also released as Modern Tales of Horror. In 1961, a shortened version was published, retitled The Red Brain; later still, the title was changed to Breakdown. 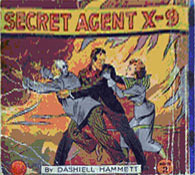 1934: A two volume compilation of Hammett-scripted “Secret Agent X-9” comic strips. 1966: “Tulip,” an unfinished novel fragment is included in The Big Knockover, edited by Lillian Hellman. 2011: The Strand Magazine, issue number 33 includes “So I Shot Him,” which, despite its title is not a crime story. 2012: Return of the Thin Man presents Hammett’s screen treatments for After the Thin Man (which has appeared in print before) and Another Thin Man (which has not). 1975: City of San Francisco magazine presents an “all-Hammett” issue, which includes an uncompleted draft of The Thin Man, in which Nick & Nora Charles do not appear. It has since been reprinted both in Nightmare Town (1999) and Crime Stories and Other Writings. (2001). Published by Alfred A. Knopf, January 1934. A condensed (and sanitized) version. Never reprinted in this form. 2013: The Hunter and Other Stories consists almost entirely of “new” Hammett material, including an unfinished Sam Spade story. ...and, chances are, there’s still more to come!